Jason Stern, one of NY's top criminal defense attorneys, is recognized and highly acclaimed by his peers, clients, and legal organizations. What Is an Open Container Violation? Open Container laws are state or local laws that prohibit the drinking of alcoholic beverages in either public places such as parks and streets or in private places such as vehicles. Nearly all states have some type of law against possessing an open container of alcohol in a public place. For the most part, these laws are selectively enforced. For example, police will ignore thousands of people publicly drinking while tailgating at a sports or music event, but enforce the law against students in a college town or pedestrians on the streets of New York City. b. No person shall drink or consume an alcoholic beverage, or possess, with intent to drink or consume, an open container containing an alcoholic beverage in any public place except at a block party, feast or similar function for which a permit has been obtained. e. Any person who shall be found to have violated any of the provisions of this section shall be punished by a fine of not more than twenty-five dollars ($25) or imprisonment of up to five (5) days, or both, or pursuant to the provisions of the family court act of the state of New York where applicable. The NYPD is one of the most prolific law enforcement agencies in the world in its voluminous issuance of Open Container tickets, issuing upwards of 40,000 summonses each year for the 10-125 (b) charge. One of the issues facing those charged with Open Container tickets is that they are often issued the summons while visiting New York City. In fact, nearly half of the summonses that I review each year are issued to non-residents of New York. Unfortunately, those summonses usually require people to come to 346 Broadway Criminal Court 2-3 months after the issuance! For most people from out of New York, returning to NYC to personally appear in court is simply not feasible. Fortunately, the Criminal Courts in New York tend to be relatively lenient on the requirement that the defendant appear in person. Nearly all NYC Courts will permit a defendant on an Open Container case to appear via his or her attorney and also permit the lawyer to accept a non-criminal violation disposition on his client's behalf (provided that the lawyer presents an authorization to the judge). If you happen to live in New York City, you'll probably choose to go to Court for yourself, but be forewarned: You could wind up spending several hours waiting in line (in the snow or rain) just to gain entry to the Courthouse (particularly at 346 Broadway) and several more hours waiting for your case to be heard. For both non-New York residents who can't be bothered to travel back to New York and NYC residents who would rather not take a day off work or spending an entire day among the 'undesirables' of criminal court, having an open container attorney appear on your behalf makes a lot of sense. If you're going to consume alcohol in public, be aware that there are exceptions for street festivals, certain park events, and stadiums. Be careful about bars and restaurants that have ambiguous boundaries — the Central Park restaurants and bars are notorious for having people step down a step and get ticketed by passing park police! 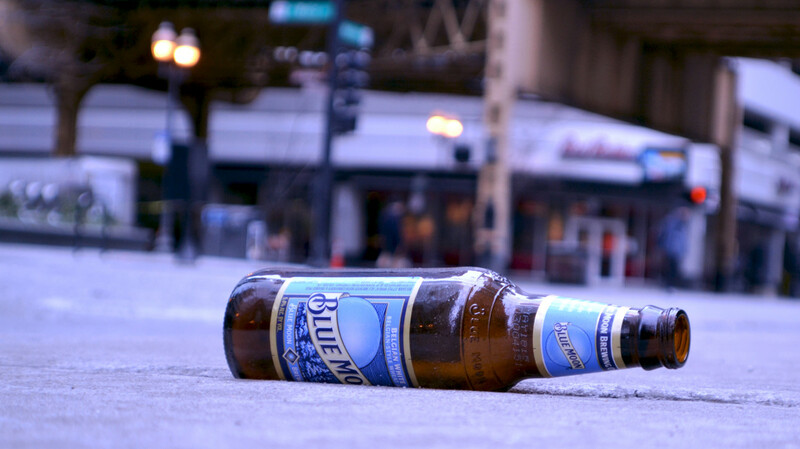 If consuming alcohol on the city streets, one would be wise not to carry an easily identifiable beer bottle or can. These are the easiest for the police to spot. Placing said alcoholic beverage in a paper bag is also a bright, red flag for police. There is no exception for bottles and cans that are inside a paper bag. Police DO NOT TEST for alcohol nor will they TASTE the beverage. A beverage in a paper or plastic cup that smells alcoholic can only be identified as alcohol by YOU. There are plenty of non-alcoholic beverages that smell exactly like beer and liquor. A sealed alcoholic beverage is not subject to the prohibitions of 10-125(2)(b). The law requires that the container of alcohol be OPEN. Merely being WITH a person consuming alcohol on the city streets should never subject a person to being cited for that same offense. The only person who can legally be charged with an open container of alcohol violation is the person in POSSESSION of the open, alcoholic beverage. I am an attorney that has been practicing criminal law and representing defendants in New York for 15 years, during which time I have also served both New York City and New York State as an Impartial Hearing Officer, Administrative Law Judge and Small Claims Arbitrator. As an expert and media personality, I have appeared on or been featured in The New York Times, Fox News, Wall Street Journal, Good Morning America, CNN, US News & World Report, Headline News, Huffington Post, ABC, Dallas Morning News, Men's Vogue, BBC Radio and countless other media outlets. I disclosed an open container citation to the USCIS as part of my naturalization application. USCIS have now asked for a court disposition relating to the matter. The citation was issued nearly five years ago, and I do not have any record of it. Any suggestions on how I can obtain a disposition? A certificate of disposition can be obtained at the court clerk’s office for a fee if you have the time to go downtown and wait on line. If not, my office can arrange to obtain one on your behalf for a nominal fee of $75 including all fees and mailing the Certificate to your current address. I was beaten and reported to CPS in White Plains where my boyfriend lives because I packed a bottle of vodka in my tote to give away because I didn’t want it. They beat me in front of my son and made up a bogus case to CPS. Is this legal? Are you referring to the police or someone else? In any event, if you were arrested or are being investigated by CPS, you may need the services of an attorney. Please feel free to reach out to me any time. Can you end up going to jail for paying a ticket late? No, you cannot. The worst that can happen after appearing but not paying is that the court can enter a notation on your credit report indicating an outstanding debt. I was visiting NYC a couple of weeks ago and got an open container ticket. I had a brown paper bag on my hand and as the cop was approaching me, I disposed of it in the trash. I told him it was an energy drink but he didn't believe me and looked through the trash but didn't find it. He tried to make me admit it was alcohol but I still said it was an energy drink. He wouldn't let me go until I admitted it so I just basically said, how can I get out of this? and he proceeded to write me a ticket. All he put was "beer" but didn't put the brand or any other details. I came across another article the ticket should have the beer brand. I lost the ticket and cannot find it online. I called the summons office and they said it's not in the system yet. I don't live in NYC and don't plan to go to the hearing for a $25 fine. What are the chances this ticket can be dismissed by the court? This is not within the definition of the law but many police officers WILL attribute a nearby can or bottle of alcohol to the nearest person and it can be difficult to convince a judge that the police officer was lying. An excellent attorney is your best bet to fight such a case. It's highly unlikely to serve jail time for an open container violation; however, if someone fails to answer the summons and appear in court, a bench warrant can be issued and that may lead to an arrest and temporary incarceration until a defendant can see the judge (typically 24-48 hours). If you've lost your ticket and failed to appear in court, there may be an outstanding bench warrant for your arrest in the State of New York, which may come up on background and credit checks in other states. Please contact a law office to see if you have a bench warrant so we can resolve that and the underlying summons at the same time. I am from South Carolina. I visited NY in June, 2016. I got an open container ticket, but I have lost it. What do I do? Can police officers attribute a can of beer to you if it is next to or nearby you but you're not holding it or in possession of it? I was fined by a police officer after he found a can of beer nearby me (it was mine but I'm curious if he could ACTUALLY know it was mine and fine me for it). The decision whether to disclose a non-criminal violation on a job application largely depends upon the wording of the question being asked. Many applications specifically exclude only 'traffic violations'. Others indicate that you must include all transgressions, including those which may have been sealed. This can be tricky because the law in New York states that a dismissed and sealed violation is deemed a nullity -- and therefore never happened in the eyes of the law. My advice is often to err on the side of disclosure, particularly where the violation itself is so minor and inoffensive as to be unlikely to prevent one's hiring. I believe this is the case with open container violations, and for that reason I recommend that clients disclose the violation (even if dismissed and sealed) when pointedly asked whether their past includes any citation, arrest or conviction. Good luck! Hello, I'm I applying for a flight attendant position and they will do an FBI background check. I stated on the application that I have never been arrested, committed any crimes or misdemeanors, or have parking tickets? They don't particularly ask about violations. But I did pay a $25 "open container" ticket in nyc, but didn't mention it on the application. Now, I'm wondering will this violation appear on my FBI 10 background check?, and maybe I should disclose this ticket to the company just in case, since it is minor? Thanks..